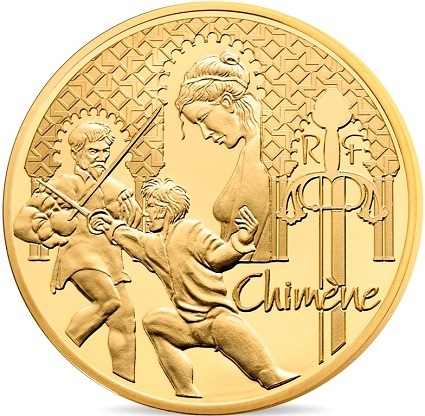 The Monnaie de Paris has launched (13th October) two more coins in the ongoing series “Heroes of French Literature.” The latest author to be featured, Pierre Corneille, was a French playwright and poet from the 17th century. Corneille started his career as a lawyer, but was always attracted to poetry and began writing in 1629. He tried his hand at writing comedy with Mélite, his first published attempt. The play was critically acclaimed and from then on Corneille was committed to the idea of a career in theater. In 1636, he wrote Le Cid, a tragicomedy inspired by the life of Rodrigo Díaz de Vivar, the Spanish knight and mercenary born in the 11th century. The story takes place in the court of Don Fernando, King of Castille, a region that is now a part of modern Spain. Rodrigo, son of Don Diègo, is in love with Chimène. She is the daughter of Don Gomèz, Count of Gormas, and is quite willing to marry Rodrigo. Luckily, Rodrigo’s father, Don Diègo, approves of this wedding and asks Don Gomèz for his daughter’s hand for his son. However, that same day, the King choses Don Diègo to be the governor and tutor to his own son, the Infante, or Prince of Castille. Don Gomèz, who had aspired to this position himself, becomes very unhappy when he learns of this nomination. As a result, an argument erupts between the two elder fathers. No longer able to contain his anger at being slighted by the King, Don Gomèz strikes Don Diègo. Insulted and offended, Don Diègo turns to his son Rodrigo to avenge his honor, as he is too old to do so himself. Wishing to uphold the honor of his beloved father, Diego decides to sacrifice his love for Chimène, and kills Don Gomèz. Devastated by her loss and filled with a hatred for the murderer of her father, Chimène asks for revenge, appealing directly to the King, Don Fernando. At the same time, Don Rodrigo is in charge of defending the City of Seville and successfully thwarts Moors attacking the city. In gratitude, the King wants to reward Don Rodrogo for his bravery in the defense of Seville, but Chimène refuses to let him forget her desire for justice. She asks to settle this dispute with a battle, promising to marry any knight in the kingdom who fights Rodrigo on her behalf. Don Sancho, a Knight who has been in love with Chimène, and who was distraught upon hearing of her betrothal to Don Rodrigo, offers to fight him on her behalf, and the king agrees. The duel ends with Rodrigo’s victory, though he lets Don Sancho live. After the battle, the King informs Chimène that Rodrigo is still alive, and orders her to forgive both Diego and Rodrigo, as he fulfilled her request to allow the battle to take place and to marry Rodrigo. Although reticent, Chimène suggests she will follow the King’s advice. The obverse side of both silver and gold coins includes the legend’s characters, portraying the scene in which Don Gomèz and Rodrigo fight following the argument between Don Diègo and Don Gomez. In the background we can see Chimène caught between the love she feels for Rodrigo and the sadness of losing her father. The reverse includes a portrait of Pierre Corneille, accompanied by the text “L’AMOUR EST UN TYRAN QUI N’ÉPARGNE PERSONNE,” an extract from the Cid. The coins are available as separate purchases. 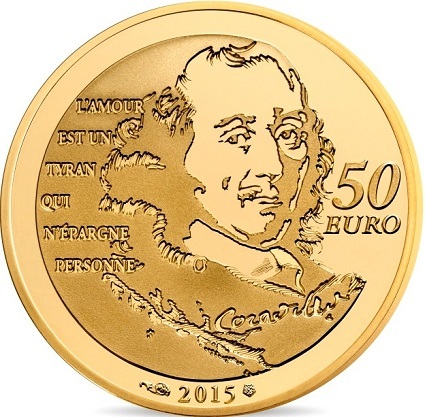 The five-year series, which began in 2011, will continue with one more 2015 issue; that coin will be launched in December and will feature French author Antoine François Prévost (1697 – 1763). For more information on these and other coins offered by the Monnaie de Paris, please visit its Web site. Information is offered in both English and French, with international orders dispatched where applicable, under the guidelines published by the Monnaie de Paris.